First, it’s important to note that salt water pools are, in fact, chlorine pools. 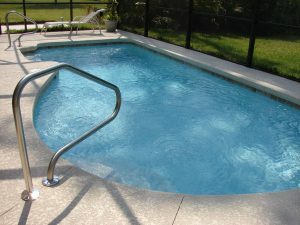 As PoolSupplyWorld.com puts it, “salt water pools have Free Available Chlorine automatically generated via the salt particles (NaCl) in your water from being exposed to an electric charge within the Salt Cell. This charge separates the salt particle into ready and available chlorine.” Let’s look at some of the main advantages and drawbacks of salt water pools. One of the most attractive benefits of salt water pools is that they’re much gentler on the skin and hair than chlorine pools. The water in these pools has a soft, natural feeling that doesn’t irritate the eyes, skin, or hair. Salt water pools also don’t have any chemical byproducts that can cause imbalances in the pool water. Additionally, salt water pools have more consistent free chlorine levels, meaning there’s a lower chance of algae growing. Salt water pools cost much more money up front than chlorine pools. Also, be aware that salt water is not ideal for use with certain pool equipment. For instance, salt corrodes some metals, so if you’re considering a salt water pool, be sure to take note of which kind of metals are incompatible with salt water. 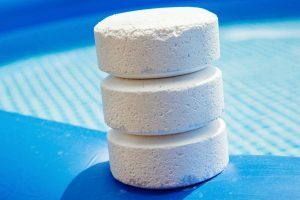 Chlorine pools use chlorine tablets or liquid chlorine, which are distributed throughout the pool via a floating chlorine dispenser or an automatic chlorine feeder. Due to its affordability, chlorine has been the choice for pool sanitation for over 50 years. Unlike salt water, chlorine can work with all pool types and pool equipment. Chlorine pools are also generally less expensive than salt water pools. Instead of a big purchase up front, chlorine pools require small, routine expenses. In addition, it’s very simple to add chlorine to pool water via a floating chlorine dispenser or adding it directly to the water. One of the biggest drawbacks of chlorine pools is that they require more upkeep than salt water pools. Chlorine must be added to the pool weekly or sometimes daily, making them less suitable for those who desire a low-maintenance pool. Along with that, tablets and chlorine pool shock contain some chemical byproducts, which can sometimes negatively affect the pool chemistry. Because of this, chemical levels in chlorine pools are more prone to change, and they are less constant than those in salt water pools. When it comes to salt water vs chlorine pools, one option isn’t better than the other. It comes down to your personal preference and what you are looking for in a swimming pool. If you’re interested in pool salt products, check out Cope Salt’s selection here.